PARIS --- Generals are often ridiculed for their habit of preparing to fight the last war while failing abjectly to prepare for the next one. In the waning days of Tony Blair’s tenure at Downing Street, characterized by a huge splurge of defense spending intended to make up for his decade-long ignorance of the military’s needs, the Ministry of Defence has gone one better: it is preparing for the war that will never happen. That trend was visible behind Blair’s reluctance to axe any of the Cold War procurement programs that are soaking up British defense spending, and thus prevent most investments in programs that are better suited to today’s actual military operations. This worrying trend was amply demonstrated by MoD’s June 7 announcement of a short-list of three vehicles for the utility vehicle portion of the FRES program, which is intended to replace in-service armored vehicles at a cost estimated at over £ 12 billion, and possibly as much as £ 16 billion. The FRES family of vehicles is urgently needed to replace the British Army’s old FV432 armored personnel carriers, Warrior infantry combat vehicles and Scimitar light tanks. In all, FRES should deliver 3,000 vehicles in three families (Utility, Heavy and Reconnaissance) of vehicles which will assume 16 battlefield roles. Operations in Afghanistan and Iraq have conclusively demonstrated that the British Army’s current vehicles are unsuited to counter-insurgency operations, to the point that MoD was belatedly forced to spend £120 million to upgrade some FV432s and buy Mastiff and Vector armored vehicles that it hopes will better protect soldiers in the field. Whatever their other qualities, the three vehicles short-listed by MoD (Mowag Piranha, Nexter VBCI and Artec Boxer) all provide insufficient armor protection, are unable to survive the large landmines and improvised explosive devices that are decimating US and NATO troops in South-West Asia, and on top of everything else are unlikely to be air-transportable by C-130 and A400M aircraft once vital add-on armor is fitted. Boxer weighs 25 tonnes empty and over 33 tonnes in combat order but can only withstand anti-personnel mines, although its manufacturers claim it offers protection against shaped charges and handheld anti-tank weapons. The Piranha IV weighs 25 tonnes in combat order, but optional add-on armor will increase its weight further, and Nexter’s VBCI has an all-up combat weight of up to 28 tonnes. In a February report on FRES, the House of Commons Defence Committee (HCDC) noted that “the Army urgently requires a fleet of vehicles which are rapidly deployable yet provide sufficient protection for Service personnel.” It is thus somewhat of a surprise to see MoD now short-list three vehicles that are marginally air-transportable and are unable to withstand large IEDs and landmines. The MoD’s inclusion of Boxer in its short-list is a surprise. Britain was originally a partner in the MRAV/Boxer program, but pulled out in 2002 after spending £57 million “because it was judged that MRAV would not be ideally suited to the type of operations envisaged,” MoD told Parliament’s Defence Committee. Apparently, this is no longer the case. MoD’s biggest failing in respect of FRES is its refusal to recognize that it can have vehicles that either have “high levels of protection” or that are air-transportable, but not both. Yet, it is a simple matter of physics. A vehicle capable of carrying an infantry group of about ten men, and offering satisfactory protection against land mines and large IEDs, cannot weigh less than 30 tonnes, especially if fitted with a protected 20-30mm turret or remotely-controlled weapon station and add-on armor protection. That means that even the future A400M transport aircraft will only be able to carry one at a time, severely limiting the ability of the Royal Air Force to deploy a combat-ready battalion by air. 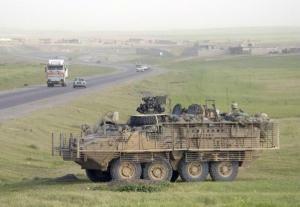 Additionally, these vehicles are not designed to withstand hits from large anti-tank mines or large IEDs, and so will not afford sufficient protection for their crews, as is readily demonstrated by the number of US Army Strykers (a modified version of the Piranha) that have been destroyed in Iraq. The photograph above shows how Strykers have been fitted with additional armor, adding to their weight and size. Within MoD, there is also a smothering fixation with network-connected vehicles that is pushing FRES into the “never-never” land of computer-driven warfare, where drones and UAVs will identify targets, and FRES vehicles will engage them in a quasi-seamless, quasi-painless automatic process. A very real component of this fixation is the entirely artificial requirement to keep up with the US Army’s “transformational” move to “network-centric” Future Combat Systems vehicles, to allow joint operations. All this, however, is pure fantasy, when the enemy is on foot, hides among the civil population, and delivers RPG or IED strikes at a moment’s notice by opening a burlap bag or detonating old artillery shells. This computer-driven warfare scenario may come true in 10 or 20 years, but it makes no sense to design the FRES program as if it already was. MoD should realize that no good will come of throwing £12-16 billion at a program that tries to adapt Cold War ideas and equipment to today’s and tomorrow’s military requirements. The best way forward is to cancel FRES, buy a few hundred more Mastiffs and similar vehicles for short- and medium-term use, and send industry back to the drawing board to design a new family of future armored vehicles that will embody the best design features that will boost their levels of protection. South Africa is a good place to go for design tips regarding vehicle survivability in counter-insurgency and armored operations. Click here for a good discussion of the FRES program and its problems, on the EU Referendum weblog.